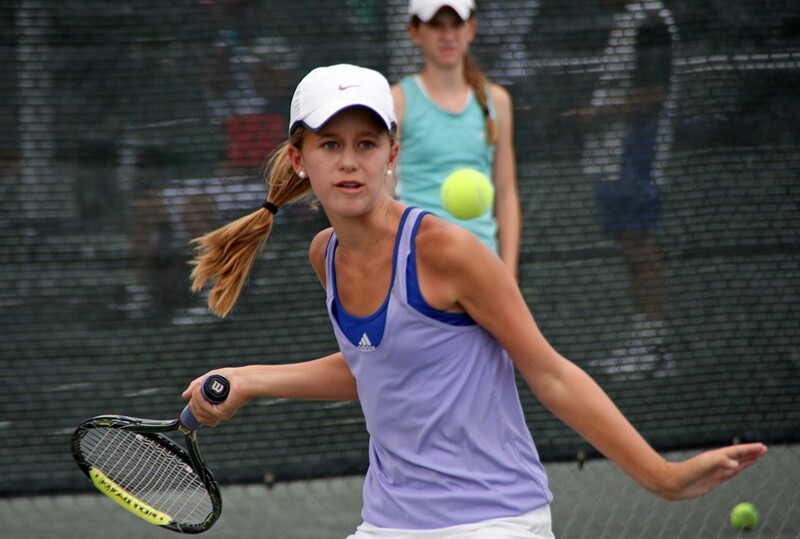 USTA Southwest Central Arizona junior Nathan Ponwith and USTA Southwest section player Maddie Pothoff had terrific weeks at USTA National 12s Clay Court Championships, held July 18-25. Ponwith (Scottsdale, Ariz.) had the best results of any Section junior during the Clays week, winning a gold ball in doubles with partner Robert Levine and a silver ball in singles at the Boys 12s Championships, held at Hanes Park in Winston-Salem, N.C.
Ponwith, the seventh seed in singles at the Boys 12s, had a stellar week going 11-1 in reaching both the singles and doubles finals. He dropped four straight seeded players en route to the final, including top seed Abhin Sharma 6-4, 6-3 in the semifinals. Ponwith’s singles final against three seed Anudeep Kodali (Raleigh, N.C.) lasted three hours, and the Scottsdale native couldn’t have been much closer to the title than he was. He got to within a game of the title at 5-4 in the second set, but Kodali broke, then pulled out the second set in a tiebreaker. Kodali forged ahead early in the third, but Ponwith gamely brought it to even, and the two forced a decisive third-set breaker to decide the match. Again Kodali jumped ahead, taking 4-1 and 6-2 leads, before Ponwith knotted the breaker at 6-6. Two errant shots long from 6-all gave Kodali the title. Ponwith did gain a measure of revenge against Kodali. 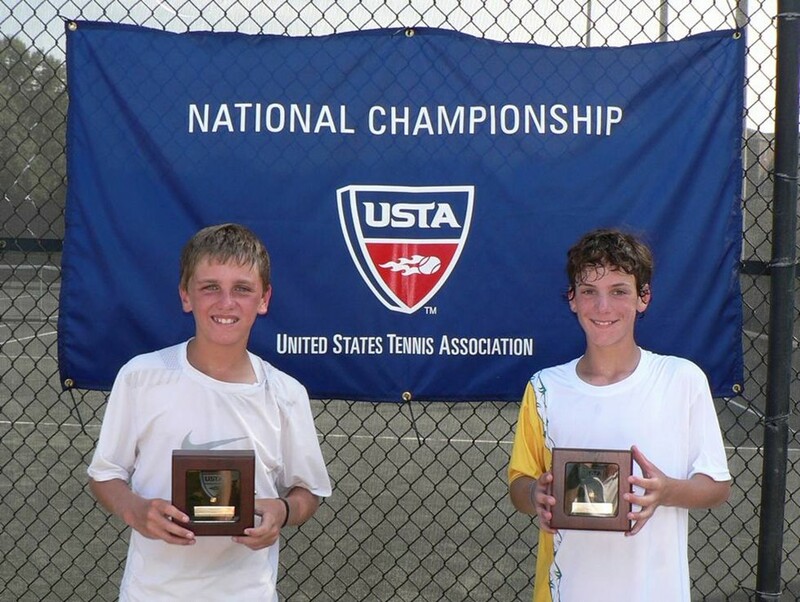 The Scottsdale 12-year-old had previously won a gold ball in doubles (right - photo courtesy of Bob Dostal) with partner Levine (Bedford, N.Y.) against Kodali and Sharma (Alpharetta, Ga.), winning the championship 6-4, 6-4. The Ponwith-Levine pairing won five straight matches together at the event. Pothoff, of Tucson, also had a spectacular result at the Girls 12s, held at the Polo Club of Boca Raton, Fla. She reached the doubles final and the Round of 16 in singles. Pothoff, the 13th seed in singles, reached her seeding, before falling 7-5, 6-1 to top-seed and eventual finalist, Sonya Kenin, a Nick Bollettieri protégé originally from Russia. In doubles, Pothoff paired with Jada Hart (Colton, Calif.) to win five rounds before falling to tenth-seeds Kenya Jones (Memphis, Tenn.) and Kaitlyn McCarthy (Cary, N.C.) 0-6, 6-3, 6-3. The sixth seeded Pothoff-Hart duo took out two of the top four seeded pairs on their way to the final. 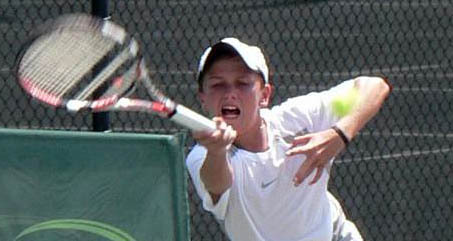 Many Section players competed at age group Clay events across the nation in 14s, 16s and 18s age groups. The Clay Courts are one of the four junior USTA Slam events, along with the Winter Nationals, the Spring Championships/Easter Bowl and the upcoming Hard Court Championships (in early August). The performances by Ponwith and Pothoff have only added to the measure of success the Southwest Section is enjoying in national junior age group championships at 12s events. Scottsdale’s Alexandra Letzt won the Girls 12s singles and doubles at the Winter Nationals in Tucson earlier this year. For results from the Boys 12s, click HERE. For results from the Girls 12s, click HERE.